To assess individual tolerance, consume 1 scoop of AMINO BUILD® NEXT GEN RIPPED in 8 oz. of water per day for up to 3 days, then follow directions below. Directions for Weight Loss: Mix 1 serving (1 scoop) with 8 oz. of cold water and consume 30 minutes before your 2 largest meals. For best results, use for 60 days in combination with a calorie-reduced diet and exercise. Do not snack between meals or before bed. 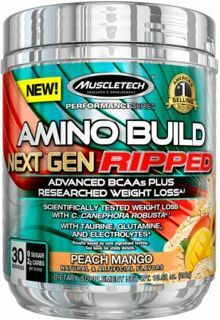 Do not exceed 2 servings (2 scoops) in a 24-hour period. For Energy: Mix 2 servings (2 scoops) with 16 oz. of cold water and consume 30 minutes before your workout. Do not take within 5 hours of bedtime. Read the entire label before use and follow directions provided. Not intended for use by persons under 18. Do not use if pregnant or nursing. One serving of this product contains up to as much caffeine as 0.5 cups of coffee. Caffeine-sensitive individuals may experience symptoms including (but not limited to) restlessness, nervousness, tremors, anxiety, increased heart rate or difficulty sleeping. Do not combine with other sources of caffeine. Consult a medical doctor if you have a medical condition or before starting any diet or exercise program. KEEP OUT OF REACH OF CHILDREN.